Valentine’s Day just passed, but few of us ever take the time to be grateful that we’re in a relationship of our choosing, or are single- even if we wish that was different. Why? Because in many parts of the world, your spouse and life is determined for you. Photo Credit: Stephanie Sinclair for National Geographic. A 14 year old mother in Yemen bathes her infant child alongside her two-year old daughter. The mother was still experiencing physical complications for giving birth, but is without access to education or health services. Being married before the age of 18 is the fate for 1 in 3 girls in low- and middle-income countries. Every day, around 39,000 girls are forced into child marriages. If the state of these affairs continue, by 2050 another 1.2 billion girls will be the victims of these forced marriages. There are serious economic, emotional and health consequences from this normalized cultural institution. These young girl’s lives and the lives of their children are at risk due to the pregnancies that occur far too early in life. These early marriages are a violation of human rights, which undermines the development of the countries in which they occur. Education is the key to advancement, on the individual level, as well as on the global stage. 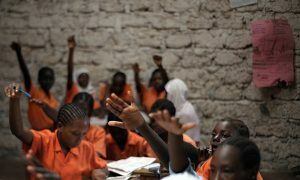 Girls lacking education are 3 times more likely to be married than their peers with a secondary or higher education, according to the NGO Girls, Not Brides. Photo Credit: Tony Karumba/AFP/Getty Images. Schoolgirls in Kilifi, Kenya. There are major health risks involved for these children, given the sexual nature of these marriages and their underdeveloped bodies. Among the perils facing these girls are obstetric fistulas, which can leave them incontinent and thus often they become social pariahs, as well as the hazards involved with teen pregnancy and sexual abuse, which are especially threatening in countries with little health and psychological resources available. In fact, globally, the second leading cause of death for girls aged 15-19 is attributed to the complications associated with childbirth and pregnancy, according to the World Health Organization. And it’s important to note that 9 out of these 10 births occur within the confines of marriage. Compounding the emotional and health issues of early motherhood is the very serious problem of financial inequality. Girls born into poverty are twice as likely to be married before 18 than their wealthier counterparts. One driving force behind this epidemic is that poor families can alleviate the financial burden of caring for a daughter by having her married off. In addition, the dowry of marriages can help these families with immediate financial needs. Besides being more likely to be married as a child, these girls are more likely to stay in poverty due to their early marital vows. Since these girls are not allowed to continue their education, the cycle of poverty continues for them and their families. The organization KAFA Violence and Exploitation released a video over Valentine’s Day, which has subsequently gone viral. It depicts a disturbing, and yet all too common image, of a 12 year old child being married off to a much older man. Fortunately, the video is staged for the purpose of drawing attention to this frequent scenario. The organization is trying to draw attention to this issue, especially in the country of Lebanon, as part of its UN supported initiative to stop child marriages. The video has already been viewed close to 2 million times and exposure like this helps bring this issue into the mainstream conversation. Photo Credit: Jessica Lea/U.K. Department for International Development/Flickr. So take heart, because hope is not lost. As more people stand up for themselves and as the world gets more educated on this issue, things are changing for the better. Loveness Mudzuru and Ruvimbo Tsopodzi, two teenagers from Zimbabwe just recently won a landmark court case against their own country on account of their own child marriages. 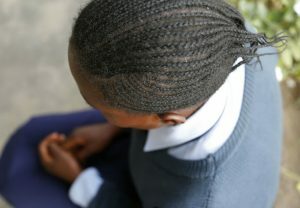 On January 20, 2016, the courts ruled in favor of the girls and made it illegal for anyone in Zimbabwe to enter into marriage before the age of 18. As inspiring people like Murzuru and Tsopodzi take a stand for themselves, their children and their future, they lift up the world and remind us that things can, and should be, different.